Here’s how to download MovieBox app on iPhone X running iOS 11.2.1 with full compatibility. There is no jailbreak or computer needed to install this app and no need to sideload the app using Cydia Impactor or similar either. 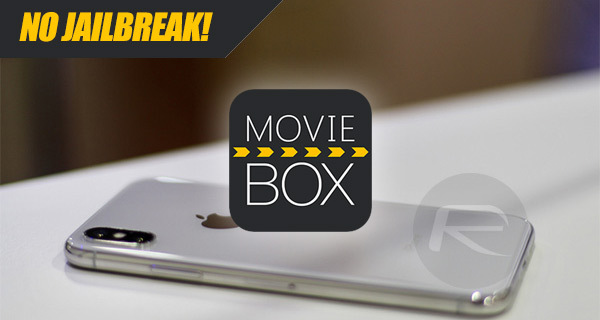 MovieBox has long been a favorite third-party installation for iOS device owners. Not available through Apple’s official iOS App Store, MovieBox is essentially a single resource for TV shows, high-definition movies, and pretty much all other media that you may care to enjoy and stream to your device. Thankfully, the MovieBox app itself has now been updated to offer support for Apple’s latest flagship, the iPhone X, which means that the app will now take full advantage of all available screen real estate. Let’s waste no more time, grab our iPhone X, and go through the process of getting the latest version of MovieBox installed. Step 1: First of all, you are going to need the TweakBox app installed on your iPhone X. For more on how to get this app on your device, check out our coverage on it here: TweakBox iOS 11 Download Without Jailbreak Now Available. Step 2: Once there, select Apps from the segmented control at the top and then scroll down and select TweakBox Apps. The apps are listed alphabetically so scroll down until you find MovieBox and select it. Step 3: Select the Install button and confirm the installation. TweakBox will do its thing and get the MovieBox app installed on your device. Step 4: Once it is installed, launch the Settings app on your device and select General > Profile(s) & Device Management. Select the profile that’s installed with the MovieBox app and then select Trust and then Trust again from the resulting pop-up. Step 5: You can now exit out of the settings app, find the MovieBox app on your device, and tap the icon to launch it just like you would with any other app. Now, thanks to the fact that it’s a new and updated IPA file, you will be able to use MovieBox taking full advantage of the larger iPhone X display without any black bars or letterboxing which was present when previous versions were installed. Is there a tweak that stops the 7-day signing window or do I need to side load it every week? If you have a dev account, then no there isn’t a tweak, you’ll need to side load it every week. Jailbreak and download better ? No, jailbreak will still have a 7 day signing. If there’s a turnaround there wouldn’t be a 7 day. Hopefully there will be one soon. I find this interesting, I’ve been using Tutu for almost a year. There’s a free version that is fine but I.paid for the annual ( $12.95). So even if apple revoked and it crashes. I’ve already downloaded it.. I simply reinstall in seconds. And I have it back. But it actually rarely ever crashes since I downloaded nesstool and run it in conjunction when ever I decide to use movie box. This is by far the BEST EVER SITUATION I HAVE FOUND. It works consistently 99% of the time. All the other hopes and links to new things like app central jyst don’t work over all..
Tutu does…. I firmly believe this..based on my experience. Is there a tweak that stops the 7-day signing window on a non-jailbroken device?